Mix Juice Grape and Raspberry is a gorgeous fruit blend vape juice. Mixing the sweetness of Raspberry with the recognisable taste of purple Grape juice, Mix Juice has created a new liquid that’s set to be an instant hit. 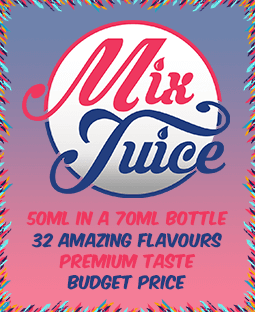 You can buy your Mix Juice Grape & Raspberry e-liquid on its own, nicotine free or you can add 10ml or 20ml or Nic Shot to create your desired strength.